Heat oven to 350°F. 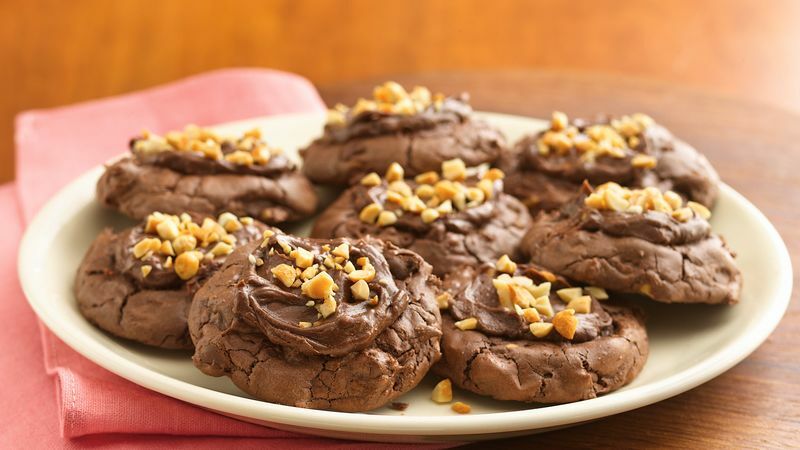 Lightly spray large cookie sheets with CRISCO® Original No-Stick Cooking Spray, or line with cooking parchment paper. Reserve frosting packet from brownie mix. In large bowl, beat brownie mix, 1/2 cup peanut butter, the eggs and vanilla with electric mixer on low speed 20 seconds. Beat on high speed 30 to 40 seconds or until completely mixed. Stir in chocolate chips. Drop 24 heaping tablespoons of dough 2 inches apart onto cookie sheets. Press thumb into center of each cookie to make indentation, but do not press all the way to the cookie sheet (if dough sticks to thumb, spray thumb with cooking spray). Bake 9 to 11 minutes or until almost no indentation remains when touched. Cool 1 minute; remove from cookie sheets to cooling rack. Cool completely, about 20 minutes. In small bowl, beat contents of reserved frosting packet, 1/3 cup peanut butter and the butter with electric mixer on medium speed until smooth. Fill each thumbprint indentation with 2 teaspoons frosting mixture, spreading slightly; sprinkle with peanuts. Let stand until frosting mixture is set. Store loosely covered in single layer.